That’s the typical soundtrack when my four-year-old is home. I love it, most of the time. Sometimes it makes writing a blog post, testing or photographing a dish, or updating my website a wee bit challenging. But I’ve become completely used to this less-than-linear work environment. This morning I was uploading photos for today’s post at the kitchen counter while trying to get Ellis to eat at least a few bites of oatmeal and apple before we headed out the door to pre-school. Did I already crop that photo? Not sure, but it will suffice. . . .
I’ve also been mightily distracted by two cookbooks I just bought. I’ve been staying up too late reading them. . . .been considering teaching new classes entirely inspired be them. . . and I’m going to post a recipe from one of them here today. I’ve seen many references to Breakfast Lunch Tea in the blogosphere lately and the hype seems justified. Rose Carrarini’s book with recipes from her bakery in Paris (Rose Bakery) is full of gorgeous photos and many simple, veggie-and fruit filled recipes. I’ve been making grated carrot salads for years. I love them especially in the winter and early spring. Dressed with plenty of lemon juice and fresh herbs they are a nice counterpoint to the heavier and sweeter flavors of the season. Carrarini’s version is so simple and so, so good. Her generous addition of salted, toasted sunflower seeds is perfect, if you can keep yourself from eating all of the toasty seeds before they make it onto the salad. Make extra so you don't skimp on the amount you add to the salad. I followed her recipe exactly with the exception of not having enough chives but having some green garlic so I finely minced that and added it. I think it would be good with parsley or tarragon or mint too. This recipe makes a lot of salad. I just had some of it for lunch and it was still delicious today. So if you have that many carrots on hand, make the whole batch. 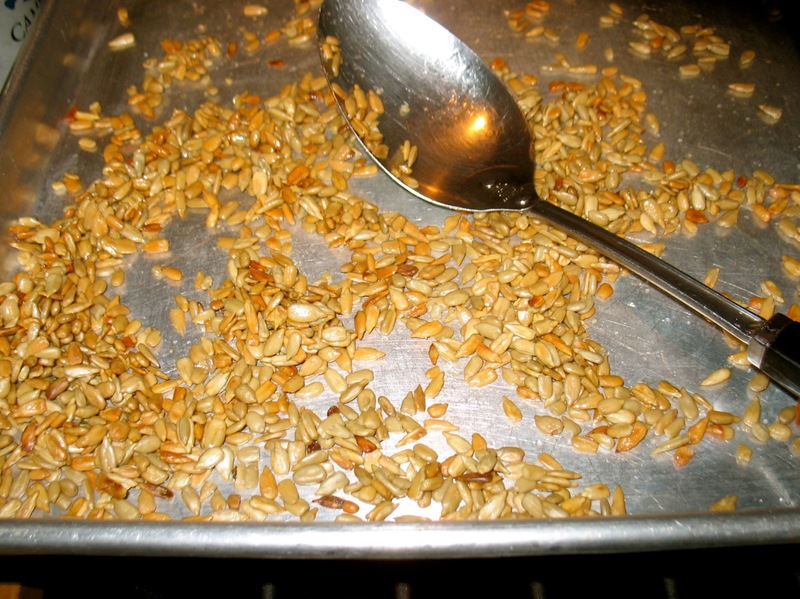 Toss the sunflower seeds with the tablespoon of oil and several pinches of salt and roast on a baking sheet for about 15 minutes, turning frequently, until they are crisp and golden. Set aside to cool. 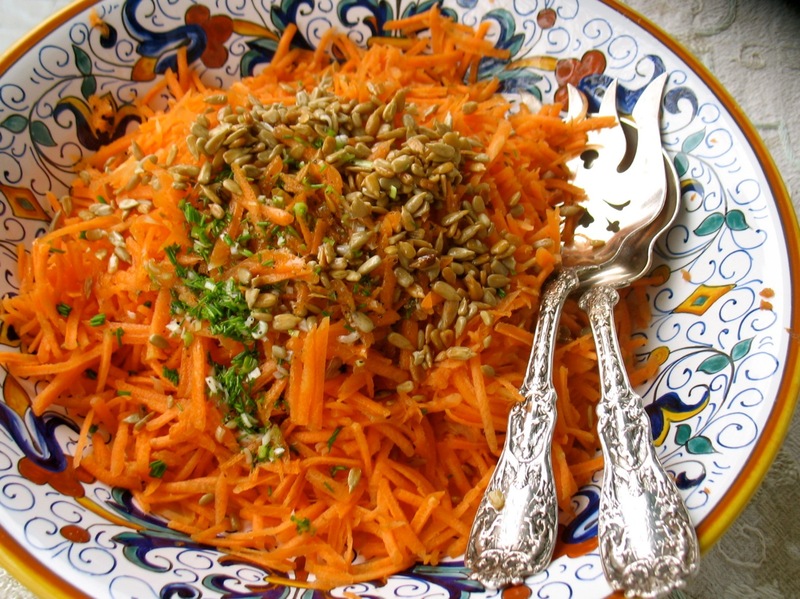 Place the grated carrots in a serving bowl. To make the dressing whisk together the lemon juice, salt, pepper and oil. Pour the dressing over the carrots and mix well. Sprinkle with the chives (or other herbs) and the seeds, mix again, and adjust seasoning and serve. ← What to do with that half-bunch of Cilantro? Yum yum you fixen vixen. Yum! I’m going to try as soon as I get some sunflower seeds. I have a fondness for grated carrot salads myself. I’ll have to try this one soon. Can’t wait to try this! I may have to add grated (raw) beets…love the combination of carrots and beets, and they are like an instant energy pick-me-up. I like that idea. Let me know how it is. 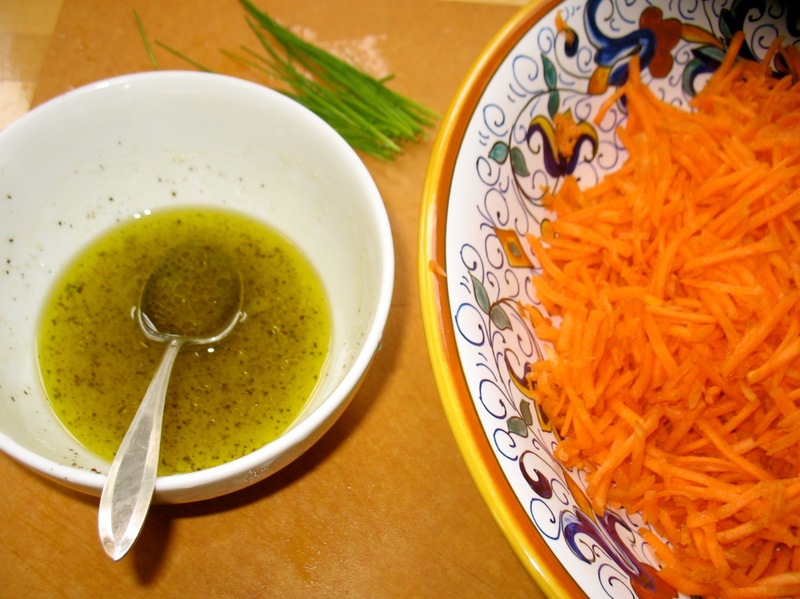 I have liked grated carrot salad ever since jr high, when we made it with raisins and mayo. I like your pretty silver serving duo, too. I made the Pasta e Ceci the other day. Good! I had 3 lunches to prepare, a strong desire for greens & whole grains, and 20 minutes to get out of the house. I grabbed the egg salad I had made this weekend (recipe below), a large container of precooked quinoa, and a bag of spinach leaves. Mixed the egg salad w/ the quinoa and a little extra mayo just to make it bind, and packed a large handful of spinach. I threw the egg quinoa salad over the spinach, and doused it with a little Balsamic I keep stocked in my work fridge & was delightfully surprised at how scrumptious it was! 1 dozen hard boiled eggs, 1 medium red onion diced, 1/3 cup chopped dill, salt, pepper & mayo to taste. Mix it up. (pretty easy, huh?) Makes about 4 good sandwiches worth. Love it! It’s so fun and satisfying when it works and it often really does. Thanks for sharing.